Every and each affiliate, both beginner and experienced, need to not only understand the market that he works with, but also be able to use effective tools to withstand the competition and drive maximum out of your traffic. The first assistante without which you can’t do is a tracker. Tracking systems help to keep all traffic under control, distribute it over a large number of parameters and “hit right at the target”. Tracking systems automate the set up and launching of your campaigns, calculate and analyze your KPI, as well as other statistics, which ultimately optimizes your ads and bring more money. One of the leaders in affiliate marketing is AdsBridge – a modern SaaS tracking software, chosen by the thousands of affiliates and media buy teams. 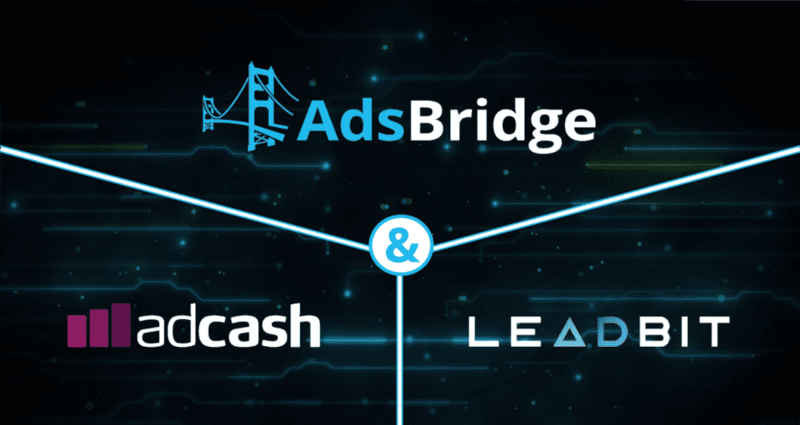 Let’s take a look on the full circle of tracking settings at AdsBridge using, as example, traffic source Adсash and affiliate network Leadbit. Open “Create traffic source” section at AdsBridge. In the field “Traffic source name” – enter Adсash. After that move back to AdsBridge and add it in “S2S postback” field. With the help of this link conversions, and all additional information, will be passed to traffic source, using system placeholders. [clickid] – substitute with AdsBridge placeholder <tracking_id>. Parameters and tokens for settings will be taken from https://support.adcash.com/?st_kb=conversion-tracking, where you will see the full list of all macroses, that can be passed from traffic source to AdsBridg. In the field “Name” – enter the name with which parameters will be displayed in the link, you can select any name that you want. In the field “Value” – enter macroses, the same way as they displayed on the side of traffic source. Next to the column with values, select the type for each Token. Primary Token – will be displayed in AdsBridge statistics, Additional Token – won’t be, it will be passed directly on the side of your offer. That’s all the settings. Save. More about traffic source settings at AdsBridge you can find here. Go to “Сreate affiliate network” section. Field “Affiliate network name” fill with Leadbit. You can also choose s1, s3, s4 or s5, these parameters can also be used to pass the value of click id. Now, let’s move to the most important settings, the postback settings. With the help of a postback conversions will be passed from Leadbit to AdsBridge. Pay attention! Link taken from AdsBridge – is a template and we need to fill it with macroses from Leadbit. As you can see, you can use only required parameters in your link (tid is exception, it must be in the postback link). Save. From now on all conversions will be passed to AdsBridge. More about how to setup affiliate network at AdsBridge you can find here. STEP 3: Offer creation at AdsBridge. Move to “Create offer” section. In main settings enter offer information taken from affiliate network. If needed you can set up conversions payout or daily cap. Select Domain and Campaign type. Enable Proxy Detecting and Bot-filter (more info). These settings are optional, but why not use so useful feature? You can also Hide referrer and Hide funnel, you need to activate the corresponding field and enter the link. On these page you’ll also see the fields to set up S2S postback and campaign tokens, they will be filled with the same information as we’ve already setup previously for Adcash. On this page you are able to set up paths and rules for traffic distribution. All settings here are clear, but if there still will be some questions you can search for answers here. In general, AdsBridge can setup the most accurate targettings with the help of landers, offers, you can also split them or setup a share between them, also use automatic optimization, that will ease up your work. This completes the settings, copy the AdsBridge campaign link, place it on the side of Adcash and start sending traffic to it. We wish you more conversions and big profit!